Orbit between the day and night collecting and avoiding other orbiting objects. Winter has arrived, you could say it's... present. A mini golf game with 9 holes. A top-down shooter with a flat simple design and steam-rolling difficulty. A racing game inspired by Super Sprint. A Top-Down, Multi-Directional, Space Shooter made entirely with creative commons assets. I love the character design. I hope you work on this more after the jam. Nice work! 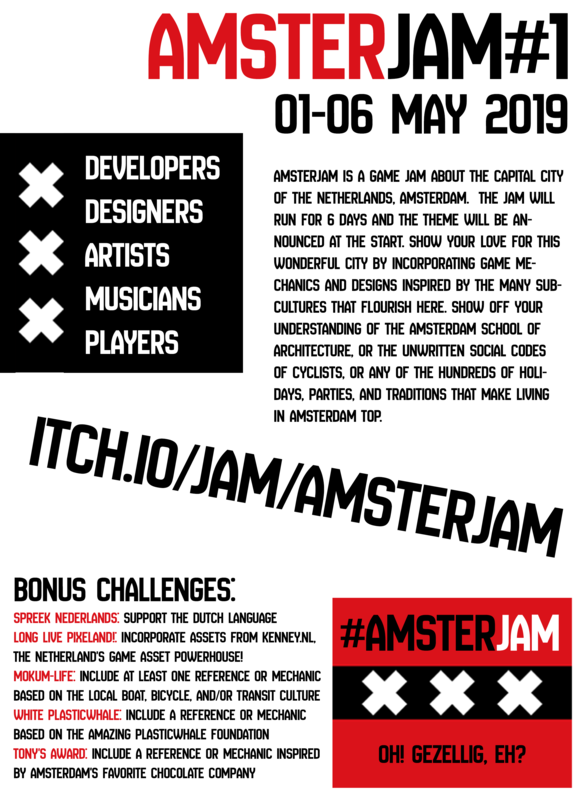 itch.io Community » General » General Discussion · Created a new topic Mark your calendars because on May 1st it's time for AmsterJam! Thanks man! I have received so may useful feedbacks and I can't wait for the game jam judging period to be over so I can implement some of them! Thanks man! Excellent feedback I could totally see myself doing another pass at this game in the future that includes these suggestions. Really good idea to add a cooldown to reversing direction! Great work I love the design and there are a ton of working mechanics here. You inspired me to finally buckle down and learn camera shake. Hey guys I couldn't play because of the fixed resolution. Use the default Unity build and then it will scale nicely. By now the game has evolved from the jam version but I was super stoked to see it in your video. Thanks so much! I slammed that all together for the Extra Credits Holiday Game Jam, the end result reminds me of the infuriating sled race in the old battle toads game lol. Btw I saw your sculptures on Twitter and they are super cool, you're very talented :) Reminds me of Maurice Sendak illustrations! Great work, it's such a complete game for being a game jam project I enjoyed playing it well done! I hope you enjoy the results of my game jam and best of luck to the other entries! Thanks man. Do you mean the white floor or the blue landing pad target that advances the level? Maybe it just spawned out of view? If you can screenshot the bug it would be much appreciated. Thanks man. I should have done a lot more to tie in the time travel story happening in the middle of the level but I ran out of time. The theme really threw me off-track this year tbh. Nice work! You really made some solid systems in a short time. Nice work this is sick! Great work man! I loved the hand-drawn style. Watch https://twitter.com/Cyberwolfgames rock the blocks! itch.io Community » Game Development » Release Announcements · Created a new topic Rock The Blocks!! I wanted to make a casual game specifically designed for a fixed resolution of 960 x 600 for itch.io. I drew inspiration from https://flatuicolors.com/ and made use of the orthographic camera and unlit material renderer. The idea is to defend your blocks while destroying the computer's. 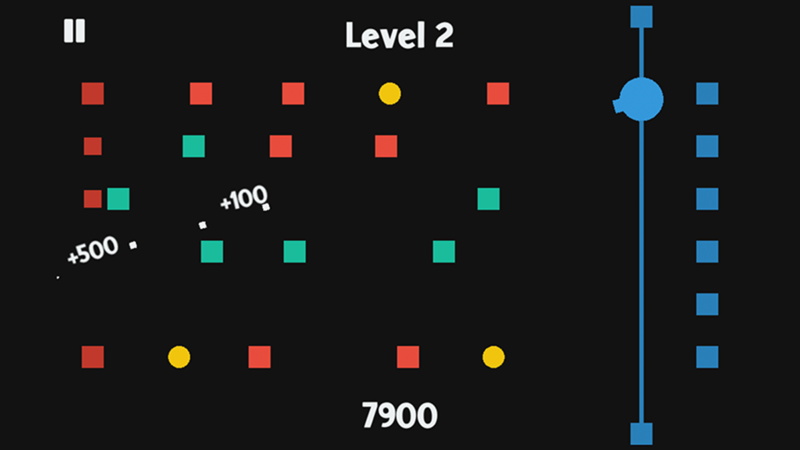 The blocks you are defending have some resilience and can take a few hits, indicated by their shrinking size and particle effects. But don't let an enemy block touch your rail mounted block shooter or it's game over man! Dust-Off Jam community · Posted in Dust-Off or Remake? Hey czeslav! The Dust-Off Jam is meant to encourage a dev to revisit an early project and give it the benefit of all the great things they have learned since then. Sounds really fun to remake a game you love in your own vision, however revamping one of your own early projects is the goal of this jam. Added a sun that rotates the earth... don't tell NDT!! Share your progress with the rest of the climate jammers as you go. I'm not sure exactly where I am going with this but the player will restore the ecosystem by rolling around this tiny planet. Maybe the player is a cloud or an animal, not sure yet.